Feeling stressed is not reserved for moments of struggle. There are also happy stressful moments. You just finished a crucial work meeting and you think it went well but then doubt creeps in. You received an increase in pay and feel like you will have to up your performance. For some unknown reason rather than celebrating your successes, there is worry and concern. It is very natural to feel insecure about experiences. Learning TM helps you embrace new positive moments. Whenever you do anything new, its natural to question its impact on your life. It is also an exciting part of life as the result may very well be positive, potentially life-changing. The best way to address this feeling of the unknown is to never stop learning, plan for things that scare you and develop habits that improve your resilience. 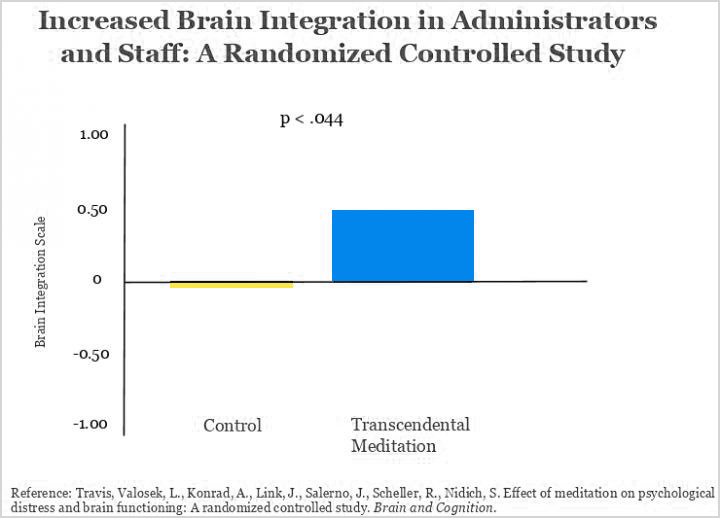 A new study shows that Transcendental Meditation reduces psychological distress in the workplace. The study found that over a four-month period, those practising the Transcendental Meditation (TM) technique experienced significant decreases in psychological distress and brain functioning, as compared to controls. This study and past research support the idea that the experience of transcending created during Transcendental Meditation systematically transforms inner experience and brain functioning, leading to changes in how one faces challenges. The challenges will continue, however one becomes increasingly resilient and effective in facing them. TM’s impact on your life has implications for organizations interested in improving the mental health, emotional competency, and resilience of their employees.